…Seth’s A Modern Trade Show handbook provides a huge lift to anyone who wants to take the leap and become a trade show magician. …If you are thinking about jumping ino the lucrative field of trade show magic, then A Modern Trade show Handbook would be a wise investment. 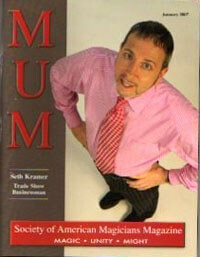 …Seth shares an abundance of information with the reader and he certainly knows what he’s talking about. …No matter how experienced you are, I am sure that there are things within this book that you could utilize to add that little bit extra to your trade show. All of the information in this book is rock solid. If you want to be a trade show magician, A Modern Trade Show Handbook should be in your library.